Why is France's Macron talking tough on Brexit? France's political leaders have not held back on Brexit. President Emmanuel Macron described some pro-Brexit politicians in the UK as "liars" at the EU summit in Salzburg. Then came Finance Minister Bruno Le Maire, who said a Chequers-style agreement backed by the UK prime minister would mean "the end of Europe". France has never hidden its allegiance to EU rules, but what is driving the increasingly blunt diplomacy from Paris? For President Macron, Brexit has never been primarily about trade. France's most important trading relationship is with Germany and the rest of the single market and Mr Macron has made it clear that he's prepared to take a hit to French exports in order to protect the rules that bind the EU club together. Image caption In Salzburg, President Macron said Brexit was the "choice of the British people, a choice pushed by those who predicted easy solutions - they are liars"
But for the French wine industry the UK is a very big market. The UK buys between a quarter and a third of all the wine France exports. 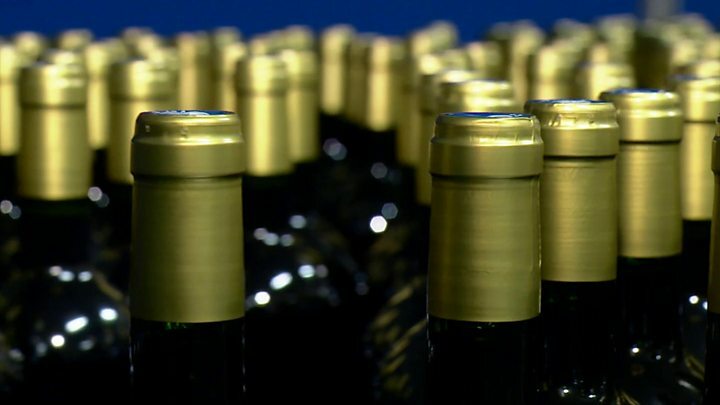 "We have no idea what will happen, so we're just sitting ducks," said Lionel Labat, export manager for Bordeaux wine merchant Yvon Mau. "The best deal will be one that's as close as possible to the situation we have today." Will EU's Salzburg summit mark a Brexit turning point? Unpredictability can make or break a vineyard - much of last year's crop was wiped out by bad weather. This is the last harvest before the UK is due to leave the EU. Profit margins at the lower end of the market are very tight, dependent on speedy border crossings and free access to the UK market. Yvon Mau, which counts a major British supermarket among its biggest customers, says it is already under pressure from Brexit, thanks to the weakening pound. British politicians are fond of saying that countries like France will support making concessions for the UK, in order to protect their economies - in 2016, the UK accounted for France's largest trade surplus in goods. But as the row over the UK's Chequers proposal grinds on, there is little pressure on President Macron to change his position. One French MP told me recently that, outside the Calais region, no-one in parliament was even talking about the risk to French industry. The feeling, he said, was that Brexit was largely a British problem and that France, snugly inside the single market, would be much more protected in the event of a no deal. But there is another pressure on Mr Macron that might be sharpening his rhetoric at the moment - next year's European Parliament elections. Making exceptions to the single market for the UK not only risks giving it an unfair economic advantage, but could also encourage EU member states - or even individual regions of France - to demand their own exceptions as well, boosting support for protectionist, nationalist parties like Marine Le Pen's National Rally. Polling ahead of the European elections suggests she's currently running neck-and-neck with Mr Macron's party, La République En Marche. And with populist nationalist parties rising in the EU, Mr Macron sees himself as fighting for the liberal democratic soul of Europe. Accepting the Chequers deal as it stands would jeopardise that fight. Instead Mr Macron has chosen to send a strong message on the costs of leaving the EU, and the benefits of staying in. And even those who stand to lose in the event of new trade barriers with the UK, like wine exporter Lionel Labat, see the single market as the bigger prize. "Germany and Belgium are very important," he told me. "Europe is a big market for wines, so it's good to be in the EU. We have the stability of the currency, and if you add together French, Italian and Spanish wines, that's an important group in terms of global consumption." The UK leaving without a deal would be terrible, he says, but not terminal. "We'll survive for sure. Can we imagine that UK residents would drink only non-European wines? I hope not!" Few here are blaming their president for the long shadow of a no-deal scenario. But Mr Macron has seemed increasingly frustrated at the UK prime minister's insistence that it's "Chequers or nothing". His threat last week not to attend a November summit on Brexit unless real progress is made in October could be seen as an attempt to pressure Mrs May into offering something else. A no-deal Brexit would risk chaos at French borders, economic pressure on surrounding regions and headaches for certain companies. The government here is preparing a bill which will give it the powers to deal with any consequences quickly. But perhaps the biggest risk for Mr Macron, if negotiations fail, is that a truly acrimonious divorce could jeopardise security and defence co-operation - a key concern for Paris after the UK leaves. Negotiations have snagged on how to manage cross-border trade, but for France it's the global politics that matters.